Fr. George Dion Dragas taught Patristics and Orthodox Theology at Durham University in England (1974-1995) and directed tens of graduate students in academic research (master and PhD programs). In 1995, he came to Holy Cross as Dean and Professor of Patristics and Church History. 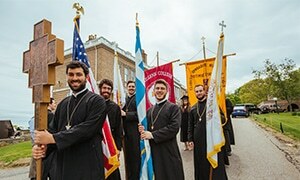 He also served as Acting-President of Holy Cross and Ecumenical Officer of the Greek Orthodox Archdiocese of America. 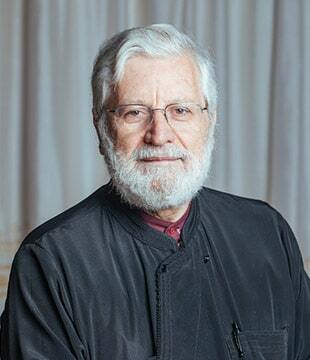 At present, he is also Visiting Professor at the Faculty of Theology of Balamand University, Lebanon, Sherbrooke Université and Laval Université in Quebec, Canada, where he teaches master and doctoral courses in Orthodox Theology and directs doctoral students. Fr. Dragas is a specialist on the Fathers of the Church (Early and Byzantine) and particularly on St. Athanasius and St. Cyril and has been responsible for updating with critical introductions the Athens reprint of Migne’s Patrologia Graeca (nearly complete). He is a life member of the Academie Internationale des Sciences Religieuses (Brussels) and has been involved in Ecumenical Dialogues for many years as representative of the Ecumenical Patriarchate of Constantinople, the Patriarchate of Antioch, and the Patriarchate of Jerusalem: in the WCC (Faith and Order) and in Orthodox/Anglican, Orthodox/Reformed, Eastern/Oriental, Orthodox/Methodist, Orthodox/Lutheran and Muslim/Christian Dialogues. He has lectured at Universities and Societies around the world. Aristotle University (Greece) awarded him the 2005 University Award for Academic Excellence. He has recently been involved with the Orthodox Research Institute (ORI) in New Hampshire (USA), initiating new publications and Series of Studies in Patristic and Orthodox Theology as editor, translator, and author. These include: Christian Philosophy in the Patristic and Byzantine Tradition by B.N., Tatakis (2007); An Overview of Orthodox Canon Law by Metropolitan Panteleimon Rodopoulos of Tyroloe (2007); and Saint Athanasius of Alexandria: Original Research and New Perspectives (2005).